Hakusan, Japan, October 30, 2013 – EIZO Corporation (TSE: 6737) today announced the 23.5-inch FORIS FG2421, the world’s first gaming monitor with a 240 Hz refresh rate. The FORIS FG2421 also features a low input lag and gaming preset modes that were developed with professional gamers to make it ideal for first-person shooter, racing, fighting, and other fast-action genres. The FORIS FG2421 comes with a new feature called Turbo 240 that surpasses the 120 Hz refresh rate of conventional gaming monitors. Turbo 240 converts 120 Hz signals to 240 Hz by controlling the blinking of the LED backlight. This high refresh rate along with a response time1 of less than 1 ms produces the smoothest image display available on a gaming monitor.. 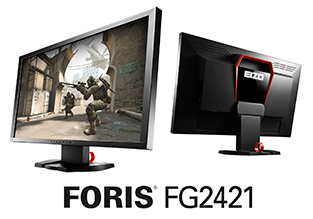 The FORIS FG2421 is the first gaming monitor with a refresh rate of 120 Hz or more to use a VA (vertical alignment) LCD panel. The VA panel provides a wide viewing angle of 176° and a high native contrast ratio of 5000:1 for deep blacks. This high contrast ratio increases visibility in dark scenes making it easier to spot enemies. EIZO developed its own integrated circuit to minimize the input lag or the time it takes for commands from a keyboard, mouse, or controller to appear on the screen. With a 60 Hz input signal the input lag is less than one frame and with a 120 Hz signal it is less than 1.5 frames. Two color modes for FPS (first-person shooter) and one for RTS (real-time strategy) games are included. The FPS and RTS modes were co-developed with professional gamers from Fnatic, a leading eSports team, to provide ideal brightness, contrast, and gamma settings. Three fully-customizable modes for users who want to import and export their own settings are also built-in. EIZO is bundling its new software, ScreenManager Pro for Gaming, with the FORIS FG2421. This software lets users download gaming presets used by professional gamers from gaming.eizo.com or export their own customized color modes to other gamers who also own the FORIS FG2421. ScreenManager Pro for Gaming can also be used to assign hot keys to turn the monitor’s power and mute on/off, as well as adjust the color mode and screen size. It is compatible with Windows 8, 7, and Vista. HDMI, DisplayPort, and DVI-D ports provide connectivity with PCs, consoles, Blu-ray players and cameras. A USB hub with one upstream and two downstream ports lets users connect peripherals such as a mouse and keyboard to the monitor. A line-out jack for connecting to external speakers and a headphone jack provide further functionality. Fast action games are often played at resolutions less than the monitor’s native 1920 x 1080. To allow for using the full 23.5-inch screen, the user can enlarge the image while maintaining the aspect ratio or expand it to fill the entire screen. The FORIS FG2421 debuts a new cabinet design. The back of the monitor features an illuminated EIZO logo on a glossy surface that is surrounded by a vermillion frame. Above this frame is a handle for carrying the monitor to a LAN party or gaming event. For viewing comfort, the stand provides 60 mm of height adjustment, 25° of tilt and 344° of swivel. A cable holder contributes to a clutter-free desktop. 1 Response time is measured as the time it takes for the backlight to blink on and off one time with Turbo 240 activated. 2 The usage time is limited to 30,000 hours from the date of purchase.